When my other half came home last week with the largest haggis I’ve ever set my eyes on, my first thought was, ‘I know exactly what I’m doing with the leftovers’! Scotch eggs! I love a Scotch egg, freshly made and still warm. Mmmmmmm. Hard boil 4 eggs, run under cold water and leave to go cold before peeling. I boiled my eggs for 5 minutes so that the yolk would still be quite soft, but not runny, in the finished dish. Beat the remaining 2 eggs in a bowl and stir in the whiskey. Set to one side. Put the flour in a bowl and season with a little salt and pepper. Set aside. Put the breadcrumbs in another bowl and set aside. 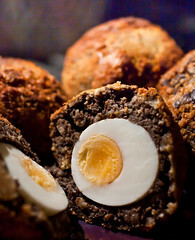 Mix a little of the beaten egg into the haggis, using your hands, so that the mixture binds and becomes more pliable. You may need to add a little more of the egg depending on how dry your haggis is but you won’t need it all (the rest of the egg will not go to waste as you will use it for the flour, egg and breadcrumbing – or paner as the French and top chefs would say!). Without the egg, the mixture just falls apart and will not hold around the egg. Line up your bowls of flour, beaten egg and breadcrumbs in that order from left to right. Lay a piece of clingfilm on your board or work surface. Take a quarter of the haggis mixture and press out onto the clingfilm to make a pattie. Take a boiled egg and place it in the middle of the haggis pattie. Now, with the help of the clingfilm, bring the haggis pattie up around the egg to encase it. You may need to do a little moulding to make sure the egg is fully covered and that there are no breaks in the haggis. Use the rest of the clingfilm to wrap the egg tightly and sit the ball in the fridge whilst you make the remaining three. Carefully remove the balls from the clingfilm, roll in the flour, then in the egg and finally in the breadcrumbs, ensuring they are completely coated each time. Set your chip pan, wok or deep saucepan of oil on the heat. Check that the oil is hot enough for frying by dropping a couple of breadcrumbs in. If they fry and turn golden brown, you’re ready to carefully lower in your first egg. If the oil is too hot, they will burn and you need to take the oil off the heat and allow it to cool slightly before you fry. Fry the Scotch eggs for around five minutes turning occasionally in the oil so that it turns golden brown all over and so that the haggis heats through properly. Remove from the heat and drain on some kitchen towel on a plate. Place in the oven to keep warm whilst you fry the remaining eggs. Now enjoy with a wee dram!